AAA Game #72 is up and running with the theme of Try a "New To You" Technique. First place winner will receive a gift certificate from our generous sponsor, Stampendous. I have been wanting to try the Bokeh Technique for a while, so this challenge was perfect for making me seize the day. I used SSS Bokeh Lights Stencil to apply the circles with PTI Fresh Snow Ink and a sponge dauber over a watercolored panel. I decided to add small shiny gold stenciled circles as an accent on the card base using Nuvo Gold Embellishment Mousse. The sentient is die cut from Winnie & Walter's The Big The Bold & The Happy using PTI's Luxe Gold Adhesive Paper. What technique have you been itching to try? I am so excited to see what CAS beauties appear in the gallery. 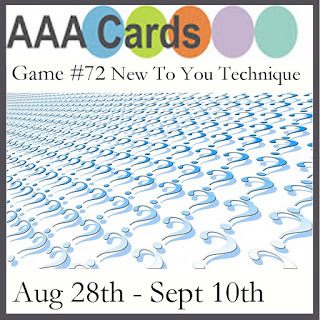 Please go on over th the AAA Cards Blog and see what our wonderful Design Team Members have to share. Then try something new and link up to the Try A New Technique gallery! Really stunning Stephanie! Love that bokeh effect and the background pops of gold are fabulous. I have tried this Bokeh Technique before but since I didn't had a great white ink I had not good result ,but your card is so beautiful and your technique turned out so great! Beautifully done! I love how the golden sparkles go diagonally across and coordinate with the sentiment. Lovely, Stephanie. So very pretty and soothing. Great bokeh, beautiful CAS and Mixed Media too. Love! Beautiful Bokeh background, Stephanie! Love these colors! Love the bokeh effect on your card. You did a lovely job of it.